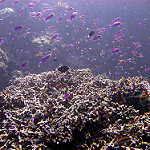 Been diving in Alung Banua? Please Vote! 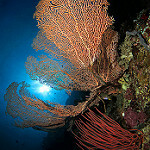 This is another wonderful dive within Bunaken National Park and is well known for great macro photography. The site is made up of a vertical wall that has quite a few caves, cervices and small nooks and crannies. 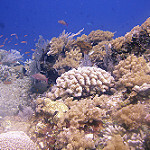 It is largely made up of varying types of hard coral. 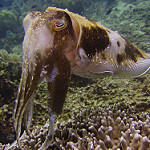 The current is normally mild which allows for great shots of the various marine life on exhibit. At around 20 metres, there are a group of small caves that are a great photo opportunity. They provide a great backdrop for an overall picture of the reef. A group of white tip reef sharks also often use these caves as a resting place. There are large schools of fish including fusiliers, and black snapper whilst there are also parrotfish, many anthias, butterfly fish, turtles and sea snakes. White tip reef sharks are also fairly common to see on this site. There can be turtles and eagle rays too, and many of the camouflage fish can be found here. 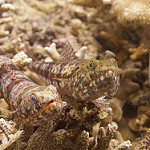 Leaf fish and other scorpion fish, frogfish, and ghost pipefish can all be seen and it is a great spot to try to photograph these fish. Map of Bunaken, Alung Banua dive site.